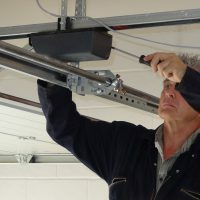 We can replace the cables on almost every make of garage door. We check the door over ensuring it runs smoothly and easily for many more years. It is important on heavier doors that the springs are matched and in good condition. This ensures the door lifts evenly and safely. 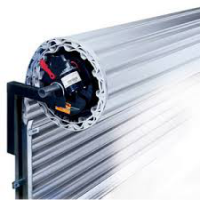 When the rollers are replaced the door will be easier for you to lift running smoothly and quietly. 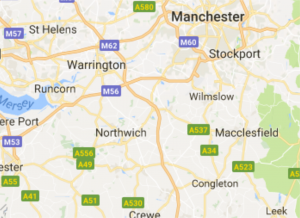 Our family has been involved in the garage door world for over 30 years in Cheshire and the North West of England. Our reputation has been built on offering a fair service and having the trust and support of our many customers, with most of our jobs being the result of recommendations. In the past we have supplied, fitted, repaired and automated, all kinds of garage doors and our extensive knowledge of every make of door is second to none. 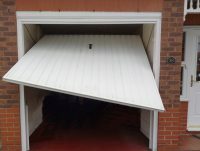 We realise that not everybody wants or can afford to replace their garage door with a new one, and our business is now focused on the repair of existing up and over garage doors, roller doors and automatic doors, using our extensive experience to give a personal and professional service. Our small team are all family members enabling you to trust our service and engineers, whether you have a snapped cable, broken spring or a door that looks completely hopeless we will do our best to help. As part of our normal garage door service we are able to make quality tension cables for almost every type of garage door on site, we carry a large collection of current garage door parts with us and when a door is obsolete and the part is no longer available we can normally modify a new part to match. We only use top quality parts to ensure reliability for many years to come.If we are unable to carry out a successful repair on your door we won’t charge for trying. Almost all domestic roller doors are motorised, with many having internal motors, this means more often than not the door has to be removed for repair. We have knowledge of all roller door repair issues and are able to remove the door replace components and refit it without damaging the door or surround. With automated doors it is important that the remote control system is up to date and working correctly for safety and reliability reasons. If your remote control door garage door is not working smoothly or making unusual noises we will be able to quickly diagnose the problem and recommend a repair or replacement automatic garage door system. Over 30 years of garage door experience we have acquired a vast amount of experience on all types and brands of garage doors including the ones below.